For the Florida criminal defense attorney associated with the Trayvon Martin case, see Mark O'Mara. Mark Francis O'Meara (born January 13, 1957) is an American professional golfer. He was a tournament winner on the PGA Tour and around the world from the mid-1980s to the late 1990s. He spent nearly 200 weeks in the top-10 of the Official World Golf Ranking from their debut in 1986 to 2000. He was inducted into the World Golf Hall of Fame in 2015. O'Meara was born in Goldsboro, North Carolina, but grew up in southern California in Mission Viejo. He took up golf at age 13, sneaking on to the nearby Mission Viejo Country Club. O'Meara later became an employee of the club and played on his high school golf team. He was an All-American at Long Beach State, and won the U.S. Amateur in 1979, defeating John Cook. He also won the California State Amateur Championship that year. O'Meara was a former resident of Orlando, Florida and lived in the same neighborhood as Tiger Woods. The two became good friends and frequently golfed together during this time. O'Meara now resides in Houston, Texas. After graduating with a degree in marketing in 1980, O'Meara turned professional and would win 16 events on the PGA Tour, beginning with the Greater Milwaukee Open in 1984. He won the AT&T Pebble Beach National Pro-Am five times, but he passed his 41st birthday in January 1998 without having won a major championship as a professional. In a late finale to his PGA Tour winning career, O'Meara won two majors in 1998, The Masters and the British Open. O'Meara's victory in The Masters came at his 15th attempt. O'Meara attributed this resurgence partly to the inspiration of working with Tiger Woods, the new superstar of the game at the time, with whom O'Meara had become good friends. In the same year, he won the Cisco World Match Play Championship and reached a career best of second in the Official World Golf Ranking. O'Meara is known for competing outside the United States more often than most leading American golfers, and has won tournaments in Europe, Asia, Australia and South America. A man with a genial demeanor, he is one of the most popular figures in international golf. In the new millennium his form took a downturn and he began to struggle with injuries, but in 2004 he won an official tour event for the first time since 1998, taking the Dubai Desert Classic title, which despite being played in the Middle East is a European Tour event. 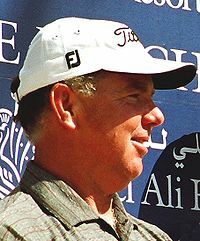 In 2007, O'Meara began play on the Champions Tour; he had many top-10 finishes in his first three seasons including several runner-up finishes, but no wins. In 2010, he broke through with a win in the Liberty Mutual Legends of Golf with Nick Price, followed by his first senior major victory in the Constellation Energy Senior Players Championship. O'Meara was sidelined by a rib injury for several months starting in April 2012; he missed the majors on both tours and did not compete until August. O'Meara has begun to develop a golf course design practice and enjoys fishing in his off time. He is currently a brand ambassador for Pacific Links International. In March 2019, O'Meara won the Cologuard Classic in Tucson, Arizona. He shot a final round seven-under 66, to win by four shots. This win ended an eight year win drought on the PGA Tour Champions. 1Defeated Allen in a sudden-death playoff. ^ "69 Players Who Have Reached The Top-10 In World Ranking" (PDF). Official World Golf Ranking. Retrieved January 14, 2013. ^ Foster, Chris (March 9, 2007). "O'Meara Comes Home For Toshiba Classic". Long Beach State.com. Archived from the original on September 28, 2007. ^ Chmiel, David (August 18, 2015). "Mark O'Meara: U.S. Amateur Victory Provided Crucial Confidence". USGA. Retrieved August 3, 2017. ^ "O'Meara withdraws from Masters before 1st round". April 5, 2012. Archived from the original on April 7, 2012. Retrieved July 10, 2012. Wikimedia Commons has media related to Mark O'Meara.